JordanCon has had an art show since 2012. This year, the artists were Michael Whelan, Paul Bielaczyc, Dim Horizon Sturio, Lisa Burris, Sara Bielaczyc, Ariel Burgess, joe Trimarchi, Edsel Arnold, Joseph O'Hara, Roy Coker, Sara Glassman, Melissa Lindsey, Laura Jones, and myself. The entries - paintings, drawings, photos, pottery, jewellery, and textiles - were of a very high standard as well as variety. A Sudy in Scarlet is a play on the title of one of Arthur Conan Doyle's books. Scarlet "things" abound in it. Its surface is mainly applique, with small amounts of embroidery. Four Faces of a Volcano shows the eruption, lava flow, sulphur vent and congealing pillow lava phases of a volcano. It is heavily embroidered in silk and also has beading. 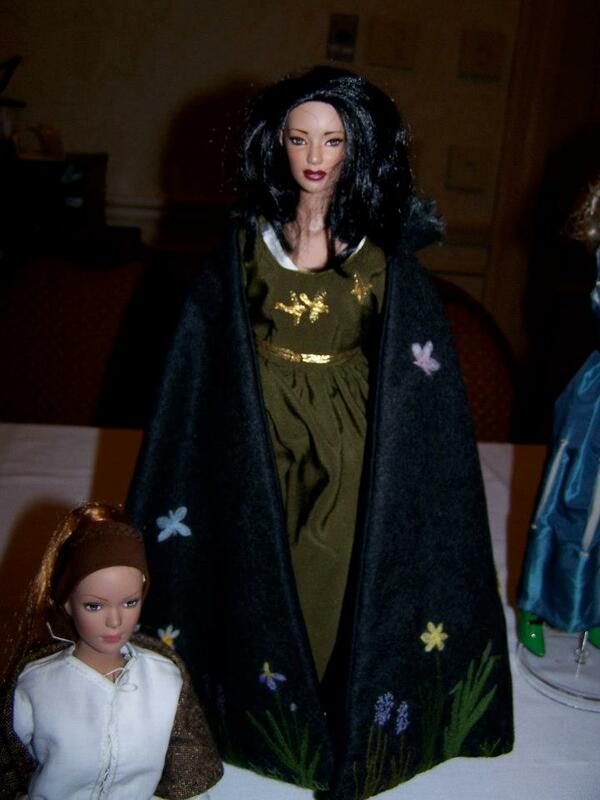 The Judges' Choice award went to Edsel Arnold for Selene. The People's Choice Award, Best Wheel of Time Art went to Joe O'Hara for The Last Battle and the People's Choice Award, Best Non-Wheel of Time Art went to Paul Bielaczyc for Counter This. All three works were amazing. To my great surprise and honour, Four Faces of a Volcano won People's Choice Award, Best 3D Art. Sales of art yielded a donation of over $575 to the Mayo Clinic's Amyloidosis research program. Here is the official summary on the JordanCon website. JordanCon this last weekend was great as always. I cannot recommend it highly enough. On Sunday I was on a WOT costume panel with JordanCon Art Director April Moore, and the artist of the Wheel of Time playing cards, Ariel Burgess. 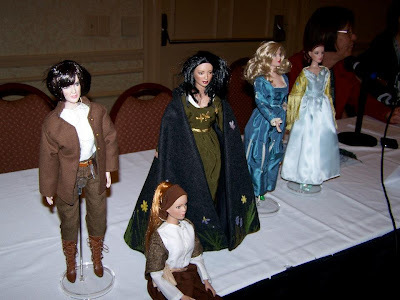 The topics we discussed included: what resources we have used to research WOT costumes, the new costumes described in A Memory of Light, divided skirts, and my dolls in WOT costume project. A Memory of Light introduced us to a few more Seanchan costumes (new outfits for Fortuona, Min and Mat) and many Sharan costumes. I'll be writing these up in the WOT Costume article update. 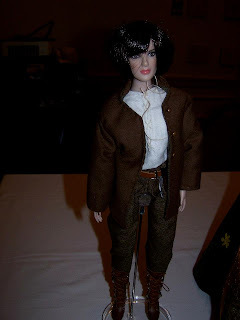 Ultimately, I hope to make some of these for the dolls, since I have dolls that match the descriptions of Mat, Min and Fortuona. The research material I use is Racinet's Pictorial History of Western Costume and R. Turner Wilcox's various books (eg Folk and Festival Costume of the World), followed by studying portraits painted in the period. Skirts divided for riding are sewn up to mid-thigh with the rest of the skirt left open; the divided skirts are like a cross between loose trousers and a mini-skirt. They rely on the bulk of the fabric in the skirts (five times the waist measurement) to keep everything covered for modesty and comfort. The dolls are quarter scale dolls in realistic proportions. I have been sewing clothes for them in styles and decoration as described in the books using the correct fabrics and threads. Below left is Aviendha, who has been featured here before. Below right is Egwene in a silk riding dress with gold birds worked across her bodice and a grey wool cloak embroidered with a field of spring flowers and butterflies. Nynaeve has two complete outfits. 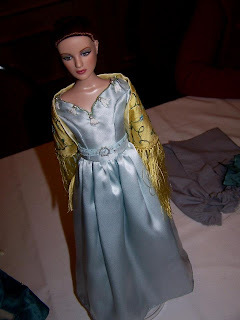 This one, below left, which has been written about here, and a grey silk riding dress that she wore when she left the White Tower to go with Liandrin. It will be detailed in a future article. As the heir to a prosperous monarchy, Elayne wears richer clothes again, in the photo below right. 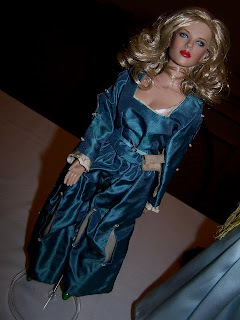 Andoran costume has an Elizabethan influence, hence the square neckline and slashed sleeves and skirts of Elayne's dress. Min is below, in her boy's villager clothes. 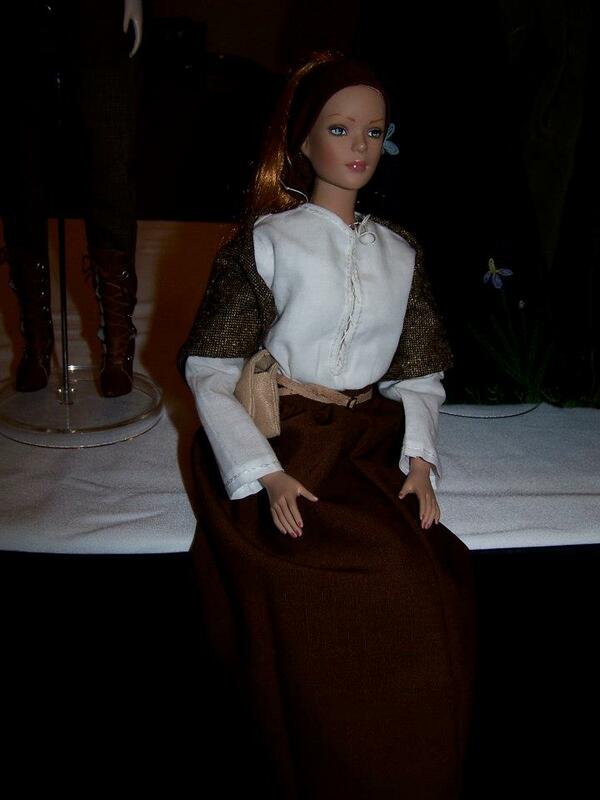 Her shirt is linen and her breeches are wool. Her cloak is wool lined with linen. The final photo is of all 5 dolls. Aviendha and Nynaeve already have a blog post on their outfits. Articles on Min's, Elayne's and Egwene's outfits and Nynaeve's second outfit are forthcoming. The updates of articles on channelling are now completed, so I've begun updating the prophecies articles with information from A Memory of Light. First up is Off-shore Prophecy. 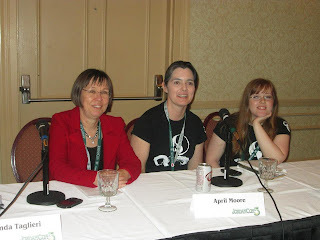 Incidentally, there will be a panel at JordanCon in Atlanta this Friday afternoon (the schedule is here) which will discuss the fulfillment of the prophecies. Some of them did not turn out as expected - some were even quite misleading. Even the Jendai prophecy may have been misinterpreted by the Sea Folk. I leave for JordanCon in a couple of days. The Weaves and Talents article has been updated with all the new information since mid 2012. As with the other articles about channelling I recently updated, there is quite a lot of new information: both for new weaves, and old. There are, of course, spoilers for A Memory of Light. Much of my time lately has been taken with organising my trip to JordanCon, which starts next week in Roswell, Georgia. It runs from April 19 to 21 and this year also hosts DeepSouthCon. It's a great convention, and one I thoroughly recommend.